America’s ambassador to Germany, Richard Grenell, has been in Berlin for a little less than a year and has been at odds with some German officials from the start. It has been retweeted more than 23,000 times on Twitter and it was made into a meme that has been shared 13,000 times on Facebook. The Kerr County Democrats, in Kerrville, Texas, posted the text on their Facebook page, for example. “Any US diplomat who acts like a high commissioner of an occupying power must learn that our tolerance also knows its limits,” Kubicki reportedly said. The comments from both members of Parliament were made in response to Grenell’s criticism of Germany’s plans for defense spending, which won’t meet NATO spending goals, not because they “consider him to stoke racism and fascism,” as the tweet claimed. Despite the criticism, Grenell remained in his post. So, while some German politicians have criticized Grenell, that’s not the same as the German government formally requesting his removal. Gregor, Andrew James (@andrewjgregor). 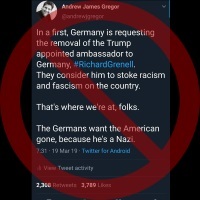 “In a first, Germany is requesting the removal of the Trump appointed ambassador to Germany, #RichardGrenell. They consider him to stoke racism and fascism on the country. That’s where we’re at, folks. The Germans want the American gone, because he’s a Nazi.” Twitter. 19 Mar 2019. “Germany: US ambassador Richard Grenell should be expelled, says FDP deputy leader.” Deutche Welle. DW.com. 19 Mar 2019. Gramer, Robbie. “State Department Defends Trump’s Man in Berlin After Diplomatic Firestorm.” ForeignPolicy.com. 6 Jun 2018. Tomlinson, Chris. “Trump’s Right Hand Man in Europe Rick Grenell Wants To ‘Empower’ European Conservatives.” Breitbart.com. 3 Jun 2018. The post Germany Not Seeking Ambassador’s Removal appeared first on FactCheck.org.